In this digital day and age, the e-commerce sales are booming and the level of competition has never been higher. Standing out in such an immensely crowded landscape is a daunting task. That is why more and more brands turn to one potent weapon: web design. To successfully wield it, one ought to draw inspiration from the best of the best, websites championing clean and modern design. This minimalist school dominates the digital ecosystem, successfully blending nice visuals with prime functionality. In the process, it does away with visual clutter and noise and offers a streamlined shopping experience. So, the trick is to learn to do more with less. That seems to be the most reliable way of creating a swell user experience and capturing the essence of a brand in digital format. Hardgraft is a great example of a website built around e-commerce offerings. There is nothing unnecessary to distract visitors. Scrolling down, they can take a good look at the product images seamlessly embedded into a soothing, neutral backdrop. Hovering over them displays a quickview feature and makes all functions accessible with just a few clicks. The main, drop-down menu is visible at all times and shows only a handful of key options and categories. Wolf Gang reminds us that e-commerce brands must follow their own brand identity, not imitate what other businesses are doing. Namely, its website flirts with the darker and heavier side of modern design, something which we do not see that often. The typography is suitably bold and it allows the design to captivate right away. What is more, there is no need to scroll all the way to fatigue. One click is all it takes to transfer you to the next section and so on. Swedish brand Via Snella boasts a contemporary and elegant look, which perfectly matches the character of its products. The product gallery is as simple and uncluttered as it gets. There are no annoying pop-ups, slide shows, and navigation bars. Product thumbnail grid works well with the rest of the layout, which involves the classic black and white color combo and a lot of whitespace. Even the use of typography is frugal. If you ask me, this is online brand building at its finest. As an industry giant, Tommy Hilfiger does not shy away from splurging on design. Brands in this league tend to hire top-notch e-commerce design professionals capable of producing bespoke solutions. So, it does not come as a surprise that its website offers only the utmost convenience of online shopping. The navigation is effortless and layout simple. Still, to make things more interesting, the brand decided to uncover its whimsical side. The design style is almost cartoonish without ever going into the unprofessional territory. Next on our list is a website that oozes the vibrant and youthful spirit, reflecting the brand behind it in the best possible manner. It makes good use of playful elements like bright tones, graphics, and GIFs without being overwhelming. Color palette and photos are always on-point. They effectively capture and retain attention, making the site a pure joy to navigate and look at. Hence, Bliss delivers on its promise of taking you on a journey towards beauty and happiness. How fun can it be to browse a website selling jump ropes? Well, Crossrope is the best proof it is possible to reach dizzying heights with e-commerce design. The marriage of high-quality images and monochromatic white background emerges utterly fruitful. Compelling videos play in the background and take the interactive experience to the next level. Due to impeccable design across the board, Crossrope managed to become a cultural movement with a large following. What better way to bring a brand to life than with great color choices and attention-arresting photography? Skullcandy gives us a master class in using these design staples and pushing the boundaries of what the BigCommerce platform is capable of. 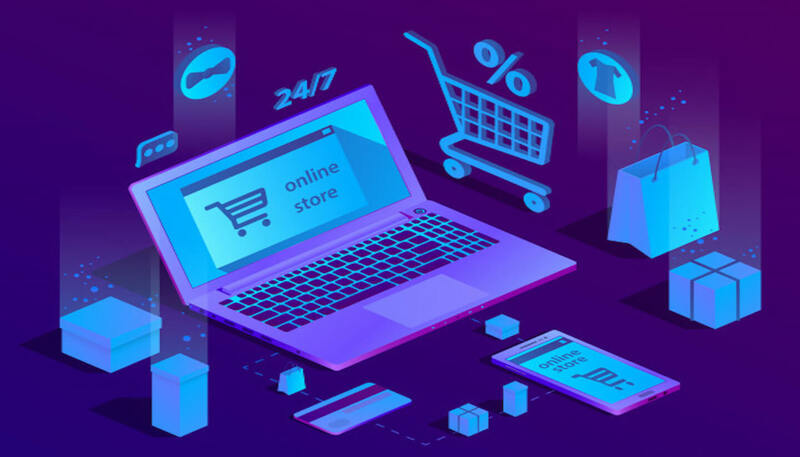 The storefront is also designed to deliver a mobile-first experience, which echoes the direction in which the whole e-commerce sector is going. Finally, the “Backstage Pass Stories” feature shows a brand’s ability to look beyond hard selling. This brand dared to be different and it paid off. Navigation layout is quite original: it deviates from the standard collection lists we see so often. Another way Hiut set itself apart is by focusing on the heritage and story behind its business. There is a great deal of content that goes into a detailed explanation of the manufacturing processes, ethos, and factory settings. On top of all that, the website features amazing lifestyle photography that forwards Hiut’s mission. Powered by Shopify, this website propelled the brand to evolve into a fully-fledged online storefront. One of the driving forces behind success is contemporary, high-resolution photography, which sets a nice tone in the background. Moreover, we have to hail the stripped-back user interface (UI), which allows the products to fully shine and guides visitors towards desired goals. I also like how there is a natural language filter. Before you know it, this feature could become an industry standard. Landing on a Kvell homepage, the user is presented with still images of products encompassed by a plenty of white space. Bold typography, a common tool in modern design, is there to highlight what the brand deems really important. The horizontal scrollbar is the main navigation feature and the interesting thing is that diving into each individual product shifts the navigation to vertical. Through it all, consistency in style and art direction prevents any confusion from ensuing. A wise man once said that simplicity is the ultimate form of sophistication and this notion is certainly embodied in Simple Chocolate’s site. The brilliant use of contrast on the homepage is complimented by a composition in which the product takes center stage, quite literally. As the user scrolls down, the color scheme and background elements change to reflect different products, while a subtle parallax effect adds extra flavor to UX. The product info can be easily picked up from the images, how convenient! Smart color choice, organization, and typography are the main reasons why the New York Times Store makes the list. The fonts are reminiscent of a paper version and instantly communicate brand values. A clean grid layout is used to facilitate the browsing and shopping experience. Selective use of bold typography directs the attention and highlights key offerings. It also helps that site loads fast and fosters a frictionless flow of UX. A lot of things were done right here. Minimalist yet striking photography sets the pace right off the bat. You get the idea what this brand is about in a matter of seconds. And then boom— Baron Fig surprises you with fun graphics and jolly phrases. If you scroll down under the fold of the homepage, you can also see a carousel of press article snippets. The end result is amazing. Online shopping is a true breeze and experience of the brand comes across as highly cohesive. The first thing that pops up with Carolina Herrera is the color scheme— tones are energizing, although not too hard on the eyes. But, I want to point out to the fact that there is a sidebar, which accompanies a standard multi-level navigation bar at the top of the page. It has a multi-level structure as well and it is no gimmick because it adds to the website’s user-friendliness. In other words, it is a nice solution both from a visual and a functional standpoint. With the help of a nice header, Tattley conveys core brand messages, specific benefits, and its value proposition. The slideshow is nothing spectacular, but it shows off products nicely. More impotently, the brand does not make the mistake of bombarding customers with a ton of product options. Categories are straightforward and enable intuitive navigation. Finally, footer includes social proof with publications listing the brand’s products that serve as trust signals. Clean and minimal design is stealing the big design show, but it is by no means an easy task to master it. One has to work with a limited set of elements and make each one count. In addition, these moving parts must fall together in a seamless manner. While pondering design choices, try to refrain from merely emulating other businesses, even those that are killing it right now. The chief goal is to flesh out your unique visual identity and make it crystal clear what you stand for. It is time to make waves.